← NFL Talk Plus Episode 35 – Jay Cutler Is Back! Ehnother Podcast Proudly Presents: Warlock Wednesday Episode #246! This week we lost a recording artist who was a part of my childhood growing up. 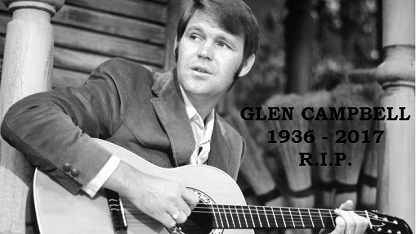 Glen Campbell passed away this past week due to Alzheimer’s… he will be missed. Annabelle: Creation creeps its way into the Box Office top spot. The Entertainment news has many announcements from movies to streaming services to reboots/remakes that may not be wanted. Plus: Comic Book Releases; Box Office Report; New Movie Releases; and of course Super Hero Movie Time. This entry was posted in Warlock Wednesdays and tagged #CanadianSmodcast, Alison Bennett, All New Guardians of the Galaxy #8, An Inconvient Sequel: Truth to Power, Anya Taylor-Joy, Astonishing X-Men #2, Ballers, Barbara Hershey, Batman #29, Batwoman #6, Black Lightning, Box Office Reports, Canadian Smodcast, Chaos Walking, comic book releases, comic books, comics, Dark Night, David Letterman, David Tennant, DC, DC Comics, Deadpool #2, Doctor Who 10th Doctor Year Three #8, Doctor Who 11th Doctor Year Three #8, Dublin City Comics and Collectibles, Dynamite Entertainment, Elle Fanning, entertainment, Everything Everything, Final Portrait, Glen Campbell, GLOW, Good Omens, Green Arrow #29, Grimm Fairy Tales Presents Tales of Terror #8, Grimm Fairy Tales Presents Tarot #1, HBO, Hellboy, Hollywood Babble On, How I Met Your Dad, How I Met Your Father, Insecure, Invincible Iron Man #10, Ireland Release Dates, Jill Kargman, Joi "SJ" Harris, Judge Dredd: Mega-City One, Justice League #27, Karl Urban, Katie Holmes, Kevin Smith, Krondon, Lemon, Logan Lucky, Lucasfilm, Marvel, Marvel Comics, Marvel Studios, Marvel's Jessica Jones, Marvin Jones III, Michael Sheen, Mighty Thor #22, Milla Jovovich, Mission: Impossible 6, Movies, Munsters, Netflix, Neuromancer, Nick Jonas, Nightwing #27, North American Release Dates, Nosferatu, Patti Cake$, personal views, Ralph Garman, Riz Ahmed, Rob Sacchetto, Robert Eggers, Rumor, Rumors, Selena Gomez, Seth Meyers, Star Wars #34, Superman #29, Television, The Dark Tower, The Hitman's Bodyguard, The Secret, Tim Miller, Timothée Chalamet, Titan Comics, Tom Cruise, Trinity #12, US Avengers #9, Vampirella #5, Venom, Walt Disney, Wonder Woman #28, woody allen, X-Files, X-Men: Blue #9, Zenescope Entertainment, Zombie Portraits. Bookmark the permalink.